Thought I’d post my new Lilou dress as I have managed to have a picture taken of me in it! The pattern is from Tilly’s book Love at first stitch. It’s a fab book that to start with I wasn’t sure if I would make all of the patterns. However I’m indeed having a good bash at most of them. I’ve made the pj trousers, a Mimi blouse that I love, the delphine skirt and now a Lilou dress. I think actually that is nearly all of them. I was given a brilliant airplane print fabric for my birthday that I’m in the process of using to make another Lilou bit with a circular skirt. Hope it turns out ok. Just the back seam and hem to go. 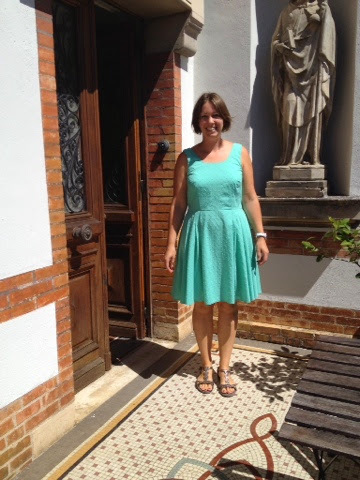 This entry was posted in Lilou dress, love at first stitch, minty green on August 21, 2014 by louise.